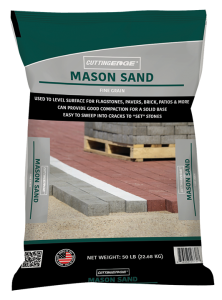 Cutting Edge® Mason Sand is an excellent choice to level surfaces for hardscape projects, such as flagstones, pavers, brick, walkways, patios and retaining walls. Our Mason Sand can provide good compaction for a solid base and is easy to sweep between cracks to “set” stones. It allows good drainage, preventing standing water from building under stones, which can reduce damage to your project from freezing and thawing. The forgiving surface can also inhibit stones from cracking or settling, and is soft on feet. Cutting Edge® Mason Sand can also reduce grass and weed growth between stones. It is perfect for commercial and residential use. Our unique UV and water-resistant, non-slip packaging can provide extra protection for outdoor storage for use year after year. Available in 50 LB. Bags – Coming Soon!